Summary: The Evo4 is the successor to the ARVA Evo3+. It is an entry-level transceiver that is targeted at the price-sensitive user. ARVA notes that it is the only transceiver with full support for multi-burials that has a retail price that is below $300us (although the Tracker3 frequently sells for less than $300). The Evo4 was released in 2015. The Evo4 replaced the Evo3+'s awkward "suppression" approach to multi-burials with true marking. This resulted in the addition of a "mark" (aka "flag") button on the front of the transceiver. The Evo4 displays a list of transceivers, and whether they have been marked, on the left side of the display. The Evo4 added a "group check" mode that you can use before you leave the trailhead. To turn on this feature, turn on the Evo4 and, while still in Send mode, press the Flag button until "CH" is displayed. While in group check mode, the Evo4 beeps if a transmitter is between 0.5 and 1.5 meters. If you get closer than 0.5 meters, it beeps loudly. You can exit the group check mode by pressing the Flag button. The audible feedback of all of the ARVA's is excellent. 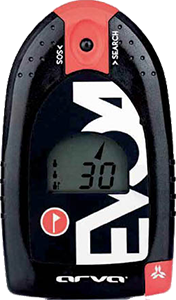 As with the Evo3, the Evo4's third antenna resolves spikes, but it is a little less sensitive to changes in distance when it gets closer to the transmitter during the fine search. The integrated harness is good in that it turns the transceiver on when you put the harness on, but as with the ARVA Evolution+, Evo3, and Evo3+, the shoulder strap severely restricts the movement of the transceiver during a fine search. You'll need to either remove your outerwear to remove the harness from your body or disconnect the harness (which turns the transceiver off), remove the transceiver, and then reconnect the harness. Both of these tasks are impractical during an emergency. There is a rumor that ARVA will come out with a different harness as an add-on purchase—I hope so. The upside of the Evo4 is its simplicity—it turns on when you connect the harness and it has only two controls, one to toggle between send and search and the other to mark a transceiver when searching for multiple victims. It also has a clear, intuitive display. The downside are its less than precise fine search, its bulky size and, I suspect, a relatively short reception range (as with the Evo3). Cons: Shorter reception range, bulky.